As promised in my previous post, I did some more research on this topic. Rather than bore you with a list of the various "well known" environmentalists who have now decided that nuclear power is a lesser evil than global warming, I'll just cut right to the rock star - even Al Gore has decided to tolerate nukes. Below is a quote from a 2006 speech by Gore at New York University. He doesn't talk about nukes much, probably because he feels his base is ambivalent about the topic. I have highlighted a few spots that I want to dig into a little more. 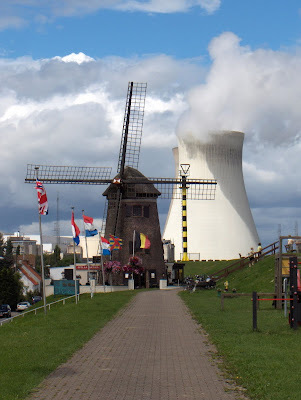 While I am not opposed to nuclear power and expect to see some modest increased use of nuclear reactors, I doubt that they will play a significant role in most countries as a new source of electricity. The main reason for my skepticism about nuclear power playing a much larger role in the world's energy future is not the problem of waste disposal or the danger of reactor operator error, or the vulnerability to terrorist attack. Let's assume for the moment that all three of these problems can be solved. That still leaves two serious issues that are more difficult constraints. The first is economics; the current generation of reactors is expensive, take a long time to build, and only come in one size - extra large. In a time of great uncertainty over energy prices, utilities must count on great uncertainty in electricity demand - and that uncertainty causes them to strongly prefer smaller incremental additions to their generating capacity that are each less expensive and quicker to build than are large 1000 megawatt light water reactors. Newer, more scalable and affordable reactor designs may eventually become available, but not soon. Secondly, if the world as a whole chose nuclear power as the option of choice to replace coal-fired generating plants, we would face a dramatic increase in the likelihood of nuclear weapons proliferation. During my 8 years in the White House, every nuclear weapons proliferation issue we dealt with was connected to a nuclear reactor program. Today, the dangerous weapons programs in both Iran and North Korea are linked to their civilian reactor programs. Moreover, proposals to separate the ownership of reactors from the ownership of the fuel supply process have met with stiff resistance from developing countries who want reactors. As a result of all these problems, I believe that nuclear reactors will only play a limited role. As Gore points out, the first three problems are easier to solve, and we were close enough to solutions in 2006 that he did not feel these were the main issues (waste disposal, operator error and terrorist attack). The solutions we have today for these problems are even better. As far as the cost of building nuclear power plants, this is more than offset in the long run by the relatively low cost of the fuel. The problem is coming up with the money to build plants in the first place. Utility companies do not want to risk a huge investment in an uncertain future. If smaller, "cookie cutter" plants were available, this would make nukes more economically viable. It looks like these plants will be available sooner than Gore expected. Navy ships have used small, reproducible designs for many years. Russia is already converting these designs for civilian use, with the first scheduled to go online in 2012. A joint Japanese/American project is not far behind. Hyperion Power in Santa Fe is taking orders for 2013 delivery of their transportable nuclear plant. NuScale Power plans on having their first small plants up and running by 2016. Babcock & Wilcox, longtime manufacturers of nuclear power plants for the US Navy, recently announced they would be entering the microreactor race. When discussing the cost of a power system, it is important to include costs that are shifted to other sectors of the economy. As long as utility companies are not held accountable for the deaths, illnesses and climate change caused by their waste products, fossil fuel receives an unjustified cost advantage. A study published in Risk Analysis found that for every Terawatt Hour (TWh) of electricity produced, using coal for fuel results in 138 Years of Life Lost in the general population. Using nuclear fuel results in only 25 Years of Life Lost. The only better technology from this standpoint is wind, with only 3 Years of Life Lost. Unfortunately, wind has limited potential due to the huge expanses of windy terrain that must be covered with wind turbines in order to generate the amount of electricity needed by modern society. Looking at greenhouse gas emissions, the United Nation's International Atomic Energy Agency found that coal produces 264 to 357 grams of "carbon equivalent" per Kilowatt Hour (KWh) of electricity produced, versus 2.5 to 5.7 grams for nuclear. No other energy source produces lower levels of greenhouse gases. This study considered emissions throughout the life of the fuel. Although nuclear power plants do not emit any greenhouse gases at all, the mining and refining of the fuel using present technology does emit greenhouse gases. On to Gore's point about proliferation of nuclear weapons ... Pandora's Box is already open when it comes to knowledge of nuclear physics. Anyone with enough time and money can obtain a nuclear weapon. Fortunately, not many "bad actors" have acquired nuclear weapons, and none have used them. Gore is assuming that increased political pressure, and increased controls over nuclear technology and materials, will not be able to offset the increased amount of nuclear hardware and fuel that will be available. It appears the opposite may be the case. The "Megatons to Megawatts" program has so far eliminated over 15,000 Russian and US warheads and turned them into fuel used in nuclear power plants. We should build a new framework for civil nuclear cooperation, including an international fuel bank, so that countries can access peaceful power without increasing the risks of proliferation.… We must harness the power of nuclear energy on behalf of our efforts to combat climate change, and to advance peace opportunity for all people. Balancing the risks and benefits of nuclear power is not easy. But I believe that the seriousness of global warming, along with improvements in nuclear safety over the past several years, will make nuclear energy a critical part of our future. Many stores will offer discount Fendi purses to make burberry replica room for the new in season bags. Because Fendi purses cost a lot, you’ll find that they almost have all the style of bags that you love if you are in time. Sometimes you can even get up to 50% off the original price, which can save you hundreds of dollars. That surely is a bargain. You can look online for great deals if you put on; t have a local Fendi store. The only problem is that you can not see the bag before you buy it. Of course, the retailer online will more than glad to give you the specification on a discount Fendi bag that you are interested in, including the authentic number that is unique to each bag. You should also demand to see pictures of the purses from different aspects so you chanel replica have an overabundance assurance that you are buying a real one. You will find many discount Fendi dealers online that will surely be able to offer a discount Fendi bag that you love. You just have to be sure that you are buying a traditional one instead of a costly reproduction is a good choice if you want to bu a discount Fendi bag online, but you must also be careful there. Don’t hesitate to ask all the questions you can thinke of approximately the bag that you are interested, from the authentic number to the stiching in the handle, as well as rhe zipper style, the lining, and the dimensions. لنقل عفش منزلك بالأسلوب السليمة استخدم أمهر النجارين والفنيين والذين يتميزون بمعرفتهم أيضاً لتغليف العفش والمفروشات باستعمال معدات تغليف خاصة لكل قطعه وترقيمها والتقاط صور قبل الفك لإرجاع تركيبه بالشكل السليم كل هذا ستجده في مؤسسة منزلك للخدمات المنزلية نحاول طول الوقتً لتقديم أرقى الخدمات. The Bombers have made three changes for the must win clash against the Swans with Travis Colyer and Ben McNiece omitted and Shaun McKernan out for the season with a hamstring injury. VETERAN Sydney defender Heath Grundy is back for the Swans but coach John Longmire hasn made any statements at selection despite the shock loss to Gold Coast last Saturday. The Swans have made just two changes with Jordan Dawson the other inclusion for Harry Marsh and Darcy Cameron, who have both been omitted. Croatia will go into their semi final after two successive rounds that went into the tie breaker and that might put them at a slight disadvantage. I say slight because modern recovery techniques and the depth in teams medical staff can get players fresh a lot faster than they would earlier. Croatia haven played to potential yet mexican shirt and Mario Mandzukic hasn fathers day shirts fired.